The spirit of time is a strange thing, it has a law upon itself, it can transforms it's own timeless creations, this was always the strength of cult Hard Rockers AXXIS. The band hailing from Lünen, Germany are set to release their new album entitled „Retrolution“ on 24. February through their own label Phonotraxx. Once again the two masterminds behind AXXIS, Bernhard Weiss and Harry Oellers have been creative, in conjuring the album title, it's a wordplay of the words „retro“ and „Revolution“. „This is exactly what we are experiencing right now“, explained Bernhard. „Vinyl albums are selling more, people even the young are still crazy about Iron Maiden, AC/DC and the sort. In the recording studio the trend is toward vintage equipment simulations, sounds are geared toward the old school sound and the old tube technology is making a comeback. New bands have a 60's/70's vibe, and the Christmas cookies my mum bakes have reached cult status in Lünen, and people still like us too!" Retro is a word that is once again very popular and revolutionary for the music lovers and their tastes. Pictured on the album cover, is an oldtimer who is swallowing a person, the expression being just how massive the Retro-Revolution has taken over the music world. 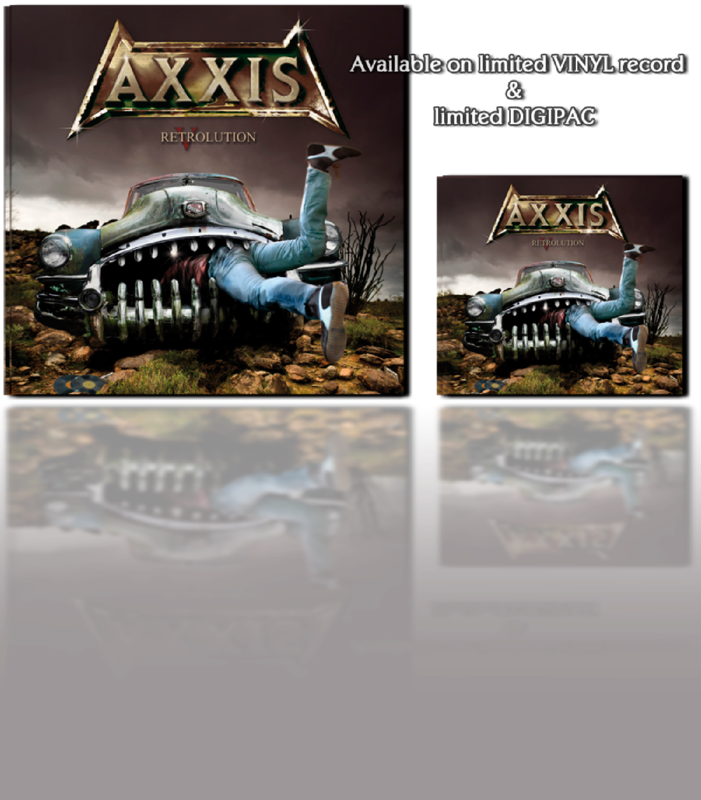 On their new release AXXIS reach back into the past to their classic pure Hard rock hymns era. Over the years AXXIS have moved with the times, but never lost touch with their roots or betrayed themselves, musically. Unlike any other German Rock bands AXXIS have found the divide between traditional and the current trend. The band have accomplished all of this without losing any of their trademarks, yet still open to new ideas. Although AXXIS' roots are from the 80's, that certainly has not harmed them, on the contrary, their last studio album „Kingdom Of The Night II“ reached their highest ever placing in their career, it climbed to number 24 in the charts. With the album „Retrolution“ the band are set to return the past, as the band was formed in this era, and are once again experiencing their own Retro-Evolution with such hits as „Stay Don ´t Leave Me“ or „Living In A World“ cast in stone in the German music scene. Their album "Kingdom Of The Night" to this day is regarded as one of the nation's most important Rock albums. To date AXXIS have amassed multiple million album sales. Recently vocalist Bernhard Weiss was rewarded with the culture award for his musical accomplishments and his outstanding work with the local youths in his hometown of Lünen. Setting an example, that not only classical music can be rewarded for their achievements.